LONDON, Sporting Alert – Defending champions Real Madrid have drawn Paris Saint-Germain in the Champions League last 16 on Monday. Cristiano Ronaldo and the Spanish giants finished second to Tottenham in their group, while the Neymar-led PSG topped their group that also included German champions Bayern Munich. At the start of the competition, bout these teams were seen as potential title contenders and many were hoping to see them meeting in the final. However, the tournament will lose either Ronaldo or Neymar in the first knockout. Meanwhile, English Premier League champions Chelsea will face five-time European champions Barcelona in the last 16. Elsewhere, Manchester United and Sevilla have been drawn together, Manchester City will take on Swiss side Basel, while Tottenham will meet Serie A title-holders Juventus. Manchester United will start as the favorite in this tie, but manager Jose Mourinho will be well aware that the Red Devils’ recent record against Spanish see them winning just two of their past 10 tries. 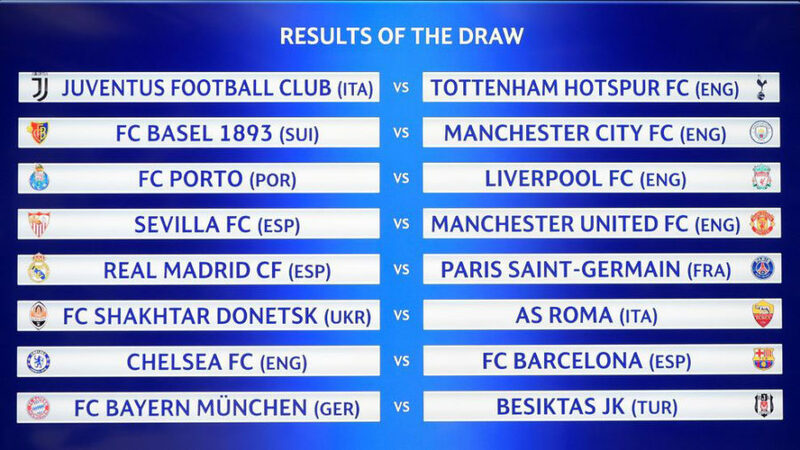 Liverpool have been paired with Portuguese side Porto, while Shakhtar Donetsk against Roma and Bayern Munich versus Besiktas complete the Champions League last 16 draw. In the meantime, with PSG and drawn together with Real Madrid, the early odds have Manchester City as the new favorites to win the Champions League this season. Sky Bet has now cut Manchester City price to 10/3 as the favorites to lift the trophy in May. The first round of the knockout will be played February 13, 14, 20 and 21 and March 5, 6, 12, 13.